Yes, I’m running as fast as I can. However -“I must run faster to get ahead of my people” - Quote from M. Gandhi; as he was trying to develop India from English rule. I have always read the articles in the past Rite Word monthly bulletins but never really understood the intensity of the research or the time it must have taken to prepare each article and to get it out in time. 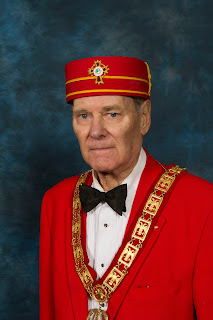 It might seem easy to the casual reader but for each new SR Master or Officer it becomes almost overbearing considering all of our additional masonic obligations. Note to Upcoming SJSR future Masters - save your monthly Rite Word bulletins now. You will really need them and your calendar for reference when you are called upon to write your own monthly Rite Word Articles. You will be lost without them. Chapter Rose Croix Specials For March 2015. Sunday, March 22, 10:00 to 3:00 pm - Oakland Aviation Museum visit. Wors Fletcher Dobbs of Liberty Lodge is leading a group to travel to the old Navy Airbase in Oakland and see (and even sit in) many of the historical US aircraft fully restored or in process of repair. This is an extraordinary collection of planes. There will be a noon-time BBQ and we can ride or car pool-along or with them. If you want to travel with us in their group or in our own SR group please let me know soon so I can reserve and coordinate all family numbers with them for reservations. Tuesday, March 24 - SJSR, All Officer Council Meeting, 7:00 PM sharp. More next month with a historic background of St. John the Baptist Day.